Is Spring lurking out there? If you can believe the forecasters, prognosticators and talking heads who disquise themselves as “meterologists,” a weather pattern with some distant relationships with something called Spring is out there and ready to come visit. Starting Saturday, daytime highs will climb into the mid and higher 50 and even flirt with 60 over the next week. My Monday, nighttime lows may even manage to stay above freezing. But doubts persist. Maybe they’re teasing us. Perhaps there is another winter blizzard waiting in the wings, ready to pounce after a few days of decent weather lulls us into a false sense of security. God, I hope not. This winter of extremes has left most of us emotionally and physically drained. Amy and I endured several brutal winters during our time in the Midwest but this one has left us worn out. I still need to rescue her car from the precipice of our driveway. I need to spend warmer days repairing a screen that the wind ripped loose on the back porch and repair dozens of minor damages from the winter that has brutalized us since Dec. 18. 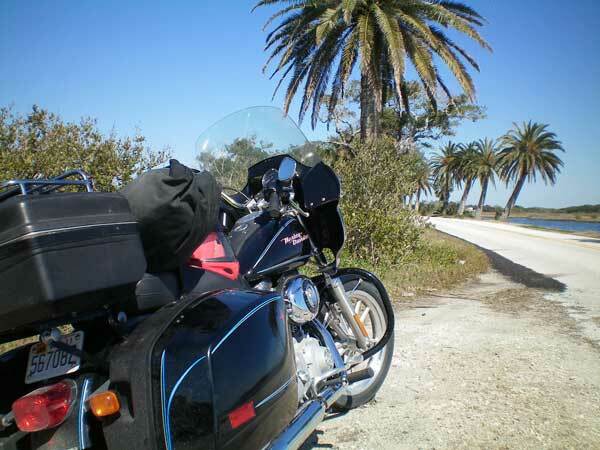 Joe Kinny, a friend and biker who runs a machine shop in Floyd, sends photos from his trip to Daytona Bike Week. That’s his modified Harley Super Glide in the photo above, enjoying the sun and warm weather in the state of my birth. It’s time like this that I wish I still lived in Florida. Hopefully, that desire will pass once this winter becomes a memory. All of us need a good dose of Spring Fever. We need to cut grass, work in gardens and plant flowers. I need to put about 500 miles on my Harley to clear my head and get regain some perspective. Let’s hope Spring drops in for a visit…and decides to stay.